Google the king of Search is now trying to be the new king of Delivery. Yes! 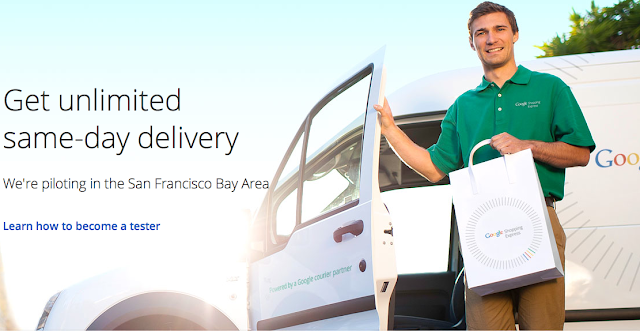 Google is starting a same day delivery service and started a pilot project in the San Francisco area. Judging by the speed at which Google is expanding it wont be surprising if one day Google starts manufacturing condoms and exploring oil. Today Google has confirmed that it is entering into a same day delivery venture on a 6 months test basis in the San Francisco Bay Area and the new service will be called Google Shopping Express. Looking at the above picture you will get to see a well dressed delivery man sporting a Google logo in you neighbourhood soon. Google has already included nine retailer logos on its Shopping Express site, including Target, Walgreens, Office Depot, and Toys R Us. Google is also recruiting "testers" to get free delivery for the entire 6-month pilot. So here is your golden chance, if you live in the Bay area, and you want free delivery from these and other stores, go sign up. Google has also included a form asking what other stores you would like to get stuff delivered from. Which means that Google is thinking of expanding the retailers. Judging by the past history, though this venture is a non-core business but given Google's efficient delivery mechanism, they could have a winner in their hands. Bay area residents please visit this website to sign in as a TESTER.